This post was originally written in 2016, but with new free products (see Borrowell below), and a friend asking about how to obtain credit scores, I thought there was value in updating this post. Credit cards and mortgages are a hot topic in the personal finance world. Since both are essentially loans, credit issuers and lenders need some kind of assurance that you can repay the loan. In verifying your ability to repay the loan, lenders generally look at a few criteria: your current income; your current debt; and, your history of repaying debt. While your current income and debt are easy to quantify, how do lenders quantify your credit history? You may already know this, but when you sign up for a credit card or a loan of any type, this activity is recorded in a database and aggregated into a credit report. A credit report will track the lender name, the balance on the account, the status, and history of the account (if you’ve paid on time, or missed payments etc). The credit information is put together and a credit score is assigned through an algorithm created by Equifax and/or Transunion – the two main credit reporting agencies in Canada. The higher your credit score, the more favorably a lender will view your application. The issue is that while obtaining your credit report is free (paper only by calling Equifax @ 1-800-465-7166 ), obtaining your credit score has a fee associated with it. That is, up until now. A number of online Canadian companies have started offering free credit scores. They offer this service as a way to generate more sign-ups to their website and obtaining your personal information (no SIN required). I’m not a big fan of giving away personal info, but I’m fairly comfortable in this case as a SIN number is not required. Generally, all you need is your name, birthday, address, and the ability to answer some multiple choice credit report questions. It’s also important to note that checking your credit score on multiple sites will not impact your credit score. Mogo – Equifax (monthly updates). I like Credit Karma in that: first, you get a access to Transunion; second, they give you weekly updates (rather than monthly or quarterly); and third, the level of detail that they give you. I think overall, Borrowell offers the most value as it provides your credit score PLUS your credit report for FREE. Why am I Interested in my Score? So being mortgage free and no expected loans coming up, why am I all of the sudden interested in my credit score? I recently realized that most of our credit cards over the past ten years have been under my name with my wife as a secondary cardholder (no credit check). Normally, this would be fine, but I wanted to make sure that my wife had creditworthiness to apply for loans/credit if need be (for example if I were to pass away suddenly). With that, I created accounts with the websites above to test them out. It turns out that she has a credit score that would fall into the “Excellent” range (in fact, slightly better than my score). With the confidence of a strong credit score behind us, we decided to sign up for a credit card under her name. The PC World Elite MasterCard promo was good timing as we shop at Loblaws, and the $100 Cineplex gift card bonus was enticing (she enjoys the movie theatre – see my SCENE points article) – so we signed up and have already received the card ($100 offer still valid today). Always pay your bills on time with at least the min required payment. Keep your amount borrowed less than 50% of your total credit available. Avoid applying for multiple credit products within a short span of time. If cancelling credit cards, avoid cancelling the ones with the longer track records. If retaining a high credit score is top priority, then avoid loan consolidation. The reason being is that your total credit available will decrease while keeping the total borrowed the same. The best thing about these free credit score websites is that you can track your credit score over time. So if you apply for a new credit card, you can see how it impacts your score, and how it recovers over time. My wife’s Transunion score dropped 10 points after applying for the PC World Elite card (but has since recovered). Take note though that you are giving away your information in exchange for the free credit scores, so be prepared to get emails from them promoting their credit products. Have you signed up with these sites to get your credit score? Are there any other sites available that do the same thing? I tried Borrowell and Ratehub and couldn’t be verified with the questions they asked about my loans/credit cards/banks. They were asking about loans with banks I’ve never dealt with, are those supposed to be trick questions or do they actually think I have those loans? I was able to get verified with Credit Karma and all my info looks correct. So do I need to call Equifax to make sure they have the correct info? Or if Transunion has the correct info can I assume Equifax does as well? I found that some of the credit questions had the choice “none of the above” which was the correct answer. Did you have that option? Yes, but that was only an option on some of the questions that had all the wrong info for each option. How accurate are these? In April I checked my credit score with an Equifax 30-day free trial and it was 830. Now RateHub (who use Equifax) says it’s 754. I’ve only opened up a Tangerine account in that time, and I always pay back my 2 credit cards in full each month, never missed a payment, etc. I know it’s not such a big deal here as it is in the US, but my credit score should be going up, not down! Credit Karma and Borrowell do not offer their services to Quebec residents. Did not try the others. Borrowell also has charting over time. Any idea if student loan debt is kept on your credit score? for some reason in the UK its not counted on it. So my debt shows as blank on mine despite being nowhere near having paid off my student loan. Any suggestions on best way to structure purchase of rental condo without using cash. Equity in home 500k+ with no debts other than first mortgage. TD flex mtg??? @David – When I purchased my investment property, I refinance my mortgage and use the proceed of the refinance to purchase my investment property. The reason that I refinance is because I wanted certainty for 5 years as I am using it to purchase an investment property. Secondly, when the rate is at 2.59%, I’ll lock it in anytime. Now the portion of my refinanced mortgage is tax deductible and the mortgage on my rental is also tax deductible. I don’t use a HELOC as the interest rate can go up when prime rates goes up. The rate on the HELOC is also more expensive (3.2%) than the refinance rate. Hope that helps. Just thinking of the latest hacking scandals, how secure are these services? I am also a bit hesitant when it comes to using third party to check on my credit score since they will have all of my information. Thanks for sharing a great post FT. I signed up with RateHub.ca and Credit Karma to get my credit scores. I wanted to check both TransUnion and Equifax to see if there is any difference between the two scores. I like Credit Karma better as I get a report and a score, but RateHub.ca on provide a score. My TransUnion score is 8 points higher than my Equifax score. Does anyone notices a difference between these two scores? Thanks! This is gold. I knew and used Borrowell but Credit Karma seems to be a great option too. Just FYI, ratehub.ca now asks for your SIN after you sign up and before it lets you see your score. I didn’t proceed. Further update — borrowell.com now claims to provide monthly (as opposed to quarterly) updates and as the article mentions, it still doesn’t ask for SIN. RBC clients can obtain their free, monthly-adjusted, TransUnion Credit Score anytime via online banking. Very convenient. Also available thru my Scotiabank account using TU Creditview. Provides great detail in the Creditview Dashboard. Does anyone notice closed accounts lingering from 10+ years ago on your report? I have a number of them and it seems odd. Capital One MC (Costco) shows the score upon online sig in. You credit score is now available for free when you logon to the CIBC website. I don’t see my credit score when I login to CIBC. Do you have to go to a specific section on their website? Thanks for this information Jack. This was a great post. Thanks. We recently took our ‘new adult’ daughter to get her first credit card and the info the bank gave us made me curious about out credit score but also cautious because they told us it is negatively impacted by inquiries! Credit Karma worked just fine. Three cards, LoC, mortgage and Rogers phone show up on my report. Cards are paid off every month. LoC is paid off. Never missed a mortgage payment. One card has 30 day late pay in Aug 2012. Rogers shows one late pay last year that’s incorrect and being fixed. Credit Score: 705 Seems low? I signed up with Borrowell and Credit Karma and got my scores. 782 (Credit Karma – TransUnion) and 822 (Borrowell – EquiFax). How come there is such a big difference between the two? Credit issuers pick and choose which agency they go with. Thus the difference in scores. Has anyone noticed any patterns as to which companies use Equifax and which use TransUnion? Can you confirm RateHub updates monthly? I got mine the first time, two years ago, but it never updated since then. Credit Karma now requires a SIN during sign-up, prior to releasing the score. Thanks Ian, I did not know that. Scotiabank now offers credit report through online banking. Hi there, Rachel from Borrowell here! Thanks for the mention in this article. 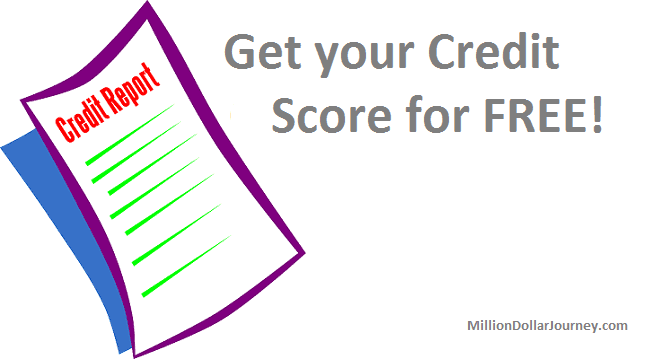 We now offer free credit scores and reports monthly to our customers :). RBC also provides COMPLETE details on your credit report. Unfortunately, there is no easy way to print it off or share it with others, e.g. for rental applications, etc. I too have noticed MANY old closed accounts that should have been removed. I will have to get them to clean that up, though it is supposed to be automatic… so much for that.